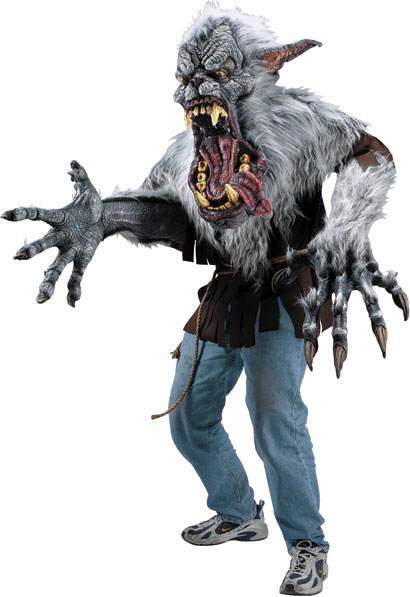 The Midnight Howler Creature Reacher Halloween costume is just amazing - as are all of the Creature Reachers. These costumes are used in amusement parks and haunted houses all over the country! Each one consists of a deluxe mask - most oversize for a monstrous effect, oversize hands on extension poles which lengthen the wearer's reach by at least two feet per arm, and a costume. On this particular Creature Reacher Halloween costume, the Midnight Howler werewolf mask is enormous! Big teeth, tongue, and plenty of fur give this beast a distinctive look. Mask extends onto shoulders. Giant furry hands hands with long fingers really get you close to your victims! Also includes a shredded shirt with rope belt to finish the look. If you're looking to make a big impression this Halloween as a monsterous beast, then this Creature Reacher costume is right for you!